Attention to fine detail is evident throughout this beautiful custom Rosewood home. 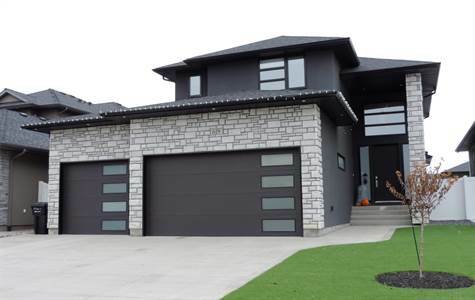 It might be easier to detail what the home doesn't have than list what it does have, from the luxurious master with 5 piece ensuite including 2 person steam shower & high back tub which overlooks 2 way fireplace, to the artificial grass, this home has everything. The chefs kitchen boasts a large island, quartz countertops are seen throughout the home (all baths and even laundry area)! The home has great flow, the floorplan has been very well thought out with open main living area, 3 bedrooms and laundry together on the second floor and fantastic entertaining area in the basement. The back yard is designed for friends and family time with a partially covered composite deck area, natural gas hookup and hot water tap to fill your hot tub. Lets not forget the dream 4 car heated garage, boarded, insulated, taped/mudded and painted (even on the ceiling) to match the inside of the house. The finer points include coat room off the garage, walk through pantry between the back door and kitchen, high end lighting package, heated floors in 2 of the bathrooms, solid core custom doors throughout, lighted stairs, touch tap kitchen faucet, hardwood throughout all the high traffic areas, the list goes on and on. If you are in need of more bedrooms there are 2 areas that could EASILY be converted to bedrooms to make a total of 6! This home is priced to sell, turn key, everything is done for you! If you aren't sold when you walk into the 18' ceiling entry just go a bit further and you will be. Measurements to be verified by buyer/listing agent.